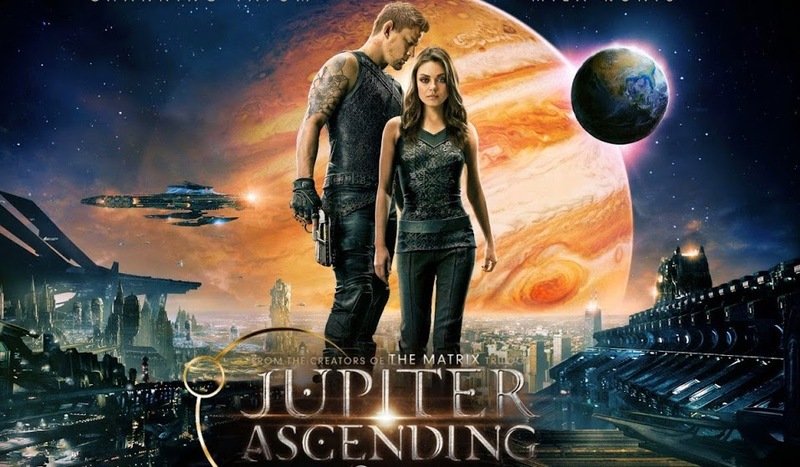 Jupiter Ascending is the latest extravaganza from the Wachowskis – spoiler alert! So far, so promisingly bonkers, but is it any good? Nowhere near as much all-out fun as Guardians of the Galaxy, which it resembles. Jupiter takes the well-trodden Alice road, another Bilbo, Arthur Dent or Dorothy dragged out of her here and now and into a wtf other world. And that’s the thing – throughout the film I’m constantly reminded of something else. It references just about every other SF film you’ve ever seen, from 1930s Flash Gordon onwards. We get 5th Element and Dark Crystal-ine flying talking dinosaurs in Brando leather jackets, pompous actor-wearing costumes explaining trade and commodities to each other in later Star Wars mode, and a whole sequence does Brazil and Harry Potter-esque steampunk bureaucracy. Jupiter‘s a modern Cinderella, and even the Wachowskis’ own Matrix trllogy gets something of a re-run. While it looks beautiful, it lacks humour and heart, and the muddled story and expositional dialogue drag. Channing Tatum (The Eagle, Foxcatcher) looks just as a genetically engineered super soldier should, and you’d want him and his skaterboots around if you were to fall off a high building, which happens quite a lot to Jupiter. It’s just that the face never cracks an expression, the lines never seem to just occur to him and there’s little chemistry between him and the oddly composed Kunis. Villain Eddie Redmayne has (Theory of Everything) come in for a lot of sneery Oscar-scuppering comments this week, but he does just what the directors ask and delivers a camp, disdainfully damaged turn, all languid whisper and can’t-be-bothered casual cruelty. Sean Bean does craggy Northern angst in one of the film’s more interesting scenes, a blokey punch-up among cottage garden flowers and swarming bees, but his treachery is downplayed and the character drifts out without ever being satisfyingly explored. In a film chock full of extreme make-up, most of the world’s mascara supplies and visual wows, the subtlety of Tuppence Middleton’s superb ageing make-up had me fooled – I thought poor actress, she may regret them not covering her little age spots properly – until the reveal.